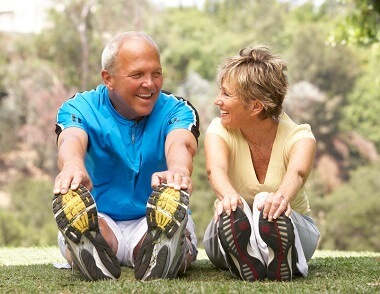 Arthritis knee exercise programmes are one of the most effective ways to reduce pain and improve function. Arthritis typically causes pain, stiffness, swelling and difficulty walking due to wear and tear on the bones and cartilage in the knee. There are a number of different treatment options for arthritis, but exercises consistently come out as being the most effective. They help to strengthen the whole leg, and to increase the movement of the knee, both of which will help to decrease arthritis pain and increase how much you can do. I suggest you try them and see how you find them, then choose the ones that feel best for you. If you can perform the maximum suggested number of repetitions of an arthritis knee exercise easily, you probably don’t need to do it. If you can’t, you probably do! Starting Position: Lying flat on your back or sitting up with your leg horizontal on a flat surface such as a bed. Place a rolled up towel (approx 10cm diameter) under the knee. Starting Position: Lie on your side with your hip and knees bent approximately 90°, feet together. If you haven’t already done so, have a look at the Top Tips and Getting The Best Results sections for general tips and guidance on exercising effectively so you achieve the best results from the exercise plans below. Once you are confidently doing these exercises, you can progress on to more advanced arthritis knee exercises. I have devised a daily arthritis knee exercise plan so you have somewhere to start, which you can find at the end of this section. Please tailor it to suit you – some exercises may be too easy or too difficult for you and therefore not appropriate. You can also find out more about arthritis including other treatment options.